Built to beautifully withstand the test of time with solid stone construction, slate roof and lead-coated copper eaves & downs. The foyer and fireplace are built upon reinforced steel structures. Interior walls are 3 staged plaster coated. Ample privacy is provided on the sprawling 3/4 acre lot with towering, mature trees. The grounds have been further enhanced with elaborate hardscaping and landscaping. Step into the majestic foyer through 10-foot high glass doors with wrought iron crested grills. A Murano glass chandelier, imported from Italy, hangs from the hand painted, silver leaf rotunda 18 feet above. Entry doors are flanked with leather panels and 10-foot tall sidelights. The space is bordered by limestone and mirrored walls. It leads through to the main hallway, which is lined with 4 pairs of plaster columns. Solid, 3 foot wide mahogany doors are found throughout, while the dining room and kitchen boast custom doors so seamlessly integrated they become virtually invisible when closed. Exquisite ceiling detail is found in every room, including coffered, tray, coved and plaster patterned ceilings. Plaster banding and extensive wall moulding and paneling throughout. All bathroom walls and pipes are sound-proofed. All tiled floors are warmed with radiant heating. The main level is defined by 12-foot ceilings, with windows lengthened by transoms to an impressive height of 10 feet. The kitchen and servery are completely enveloped in floor-to-ceiling cabinetry, punctuated by Statuario marble counters and backsplash. Both rooms provide the finest built-in appliances that Wolf, Miele and Sub-Zero have to offer. An epic, 2-storey great room with 2 levels of windows makes way to a sizable library. A 24-foot, true cut Indiana limestone two-sided fireplace divides the spaces. The library features herringbone hardwood flooring, Macaray wood bookcases and cabinetry, and an integrated bar with marble countertop and drainless, trough-style sink. The ceiling and walls of the avant garde powder room are swathed in leather and suede, while the mahogany cabinetry features Swarovski crystal handles. Upstairs, 10-foot ceilings prevail. All 4 of the spacious bedrooms are accented with Juliet balconies and each enjoy the privileges of private yet lavish ensuite baths. The master bedroom ensuite is particularly opulent, with MTI Air Bath and frosted glass walls surrounding the shower and private water closet. The master dressing room is fully outfitted in floor-to-ceiling Macassar Ebony cabinetry. The bright and beautifully finished laundry room is conveniently located on this level. The expansive lower level is ready to be customized to your exact specifications. With over 3,800 square feet to work with and ceilings nearly 11 feet high, the possibilities are limited only by your imagination. Radiant heated concrete slab flooring ensures the ultimate in comfort. The interior of the 8-passenger elevator is finished in Ostrich and services all 3 levels. Home automation provided by Crestron, with touch screen technology. Built-in surround sound in all principal rooms and the master bedroom. 3 furnaces. 7,485 sq ft above grade, plus 3,858 sq ft in the unfinished lower level. 3-car tandem garage. 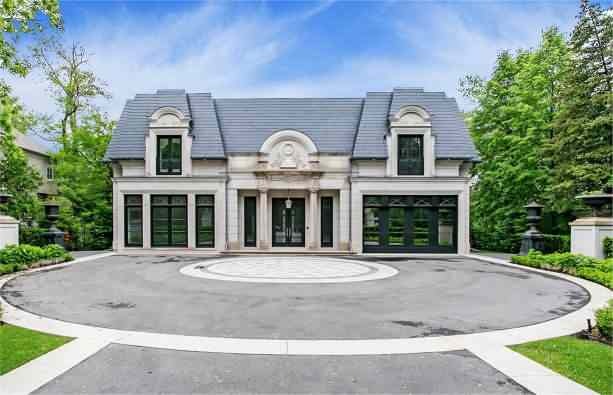 This magnificent home with illustrious finishes is ideally located on Oakville’s “street of dreams”, close to the fine shops and restaurants of the town’s downtown core. 30 minute commute to the heart of downtown Toronto. Your investment in this newly built, turn-key home is protected under a Tarion warranty.